One of my Googly Ghoul friends, Frankie, has come to visit today! 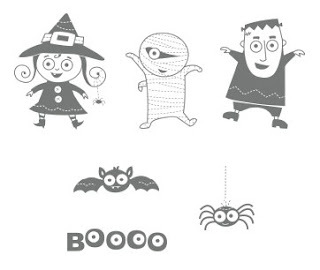 You know how much I love this stamp set, especially combined with the Ghoulish Googlies Designer Kit. I used two of the tags in the kit, and flipped one over to reveal the Limeade and Black chevron design. Add the stamped image and a greeting, and this cute but creepy project needed little more to complete it. It's black tie week at Dynamic Duos, which was the inspiration for this project. 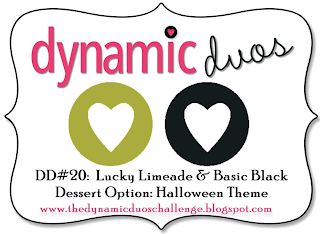 They have selected Lucky Limeade and Basic Black for this week's colors, and an optional Halloween Theme. Love it! 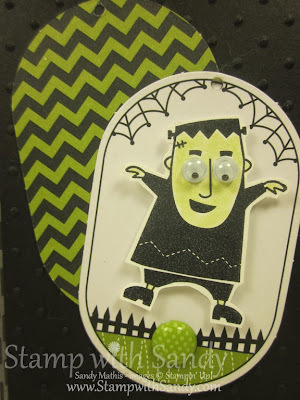 I stamped Frankie in Black Stazon Ink, then used a blender pen and Lucky Limeade Ink Pad to color his skin a ghoulish shade of green. I wanted to cover up the little orange star at the bottom of the tag, so I added a Designer Printed Brad in Lucky Limeade in it's place. A couple Googlies for eyes and Frankie is lookin' good! 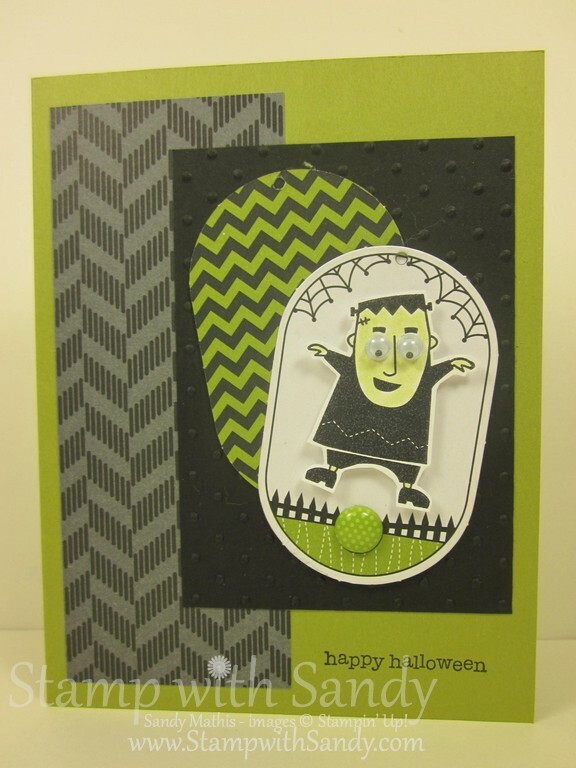 Ahahaha - I just adore this fun Halloween card. I'm loving what everyone is doing with that stamp set, and those labels had me drooling in the catalogue. I really like how you used two on this card, flipping the one over - AND the little brad you added? Perfect! Thanks for playing along at Dynamic Duo's this week. I like what you've done with little Frankie, the webs and the teeny fence! Very cute little scene. Thanks for playing along with us at Dynamic Duos! Super cute Sandy, love that little Frankie!! Congratulations, Sandy, for the Honorable Mention at DD for this great card!